You’ve probably seen the driverless race car that’s set to compete in a new series called “Roborace.” Come later this year, teams will do battle on city streets and purpose-built racetracks in what is being dubbed the “battle of algorithms.” The consensus among race fans remains that this is an awful idea. But I’m not buying that. In fact, I think it’s awesome, and it could, ultimately, be the answer to motorsport’s biggest problem: Innovation. Self-driving technology is a hot topic. Given I now work at Beepi, which is located in the heart of Silicon Valley, we see Google Cars crawling the streets of Mountain View every day. As a technology company ourselves, we have strong opinions regarding the future of transportation. And for me personally, I’ve spent 20+ years racing cars professionally, so you know the concept of a full-on autonomous racing car is going to grab my attention. Before we dig in to why I think this concept is cool, let’s look at how the series will actually work. First, every car will be identical, right down to the sensors that cover almost every inch of bodywork. Where teams will have the ability to shine is in the software. No exact drivetrain details have been shared, but we do know the technology powering the car’s operation is an “Nvidia Drive PX 2" AI brain, while extensive front and rear cameras, ultrasonic sensors and radars deliver that ‘brain’ the information it needs. If you’re thinking this sounds like something out of a William Gibson novel, you’re not alone. What’s the appeal of a race series with no drivers to route for, and cars that are programed to all perform at the same optimum level? As you may have heard, the person who put pen to paper—a chap named Daniel Simon—is, in fact, not a science fiction writer. He creates cars for Hollywood movies, which is fitting given this does seem like a cross between “Minority Report” and “Driven.” Let’s just be thankful uncle ‘Sly’ had nothing to do with this. 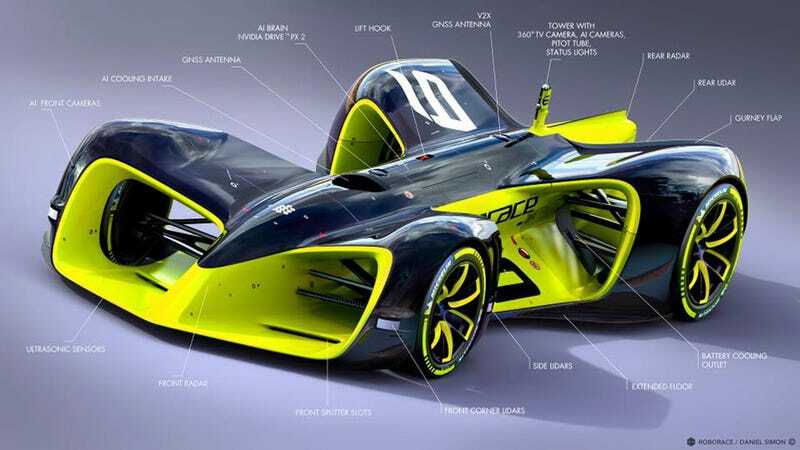 When Roborace was first revealed back in March, racing enthusiasts were vocal, especially with their distaste for the idea. After all, what’s the appeal of a race series with no drivers to route for, and cars that are programed to all perform at the same optimum level? There will be no tire smoke; no running wide; no mistakes (in theory) because robots don’t make mistakes; no managing cold tires better than others; no getting fatigued. There will be no daring passes under braking, either, because the cars will be programed to brake at the latest possible moment anyway, and if you brake later than that, the chance of crashing will be high. A robot, unlike Pastor Maldonado, will be programmed not to do that. And it’s not just race fans feeling this way. The public aren’t feeling too hot about autonomous vehicles in general. At Beepi, we conducted a survey that looked into how people were reacting: 61 percent of all Americans said they’d feel scared to drive in (or be driven in, as it were) an autonomous vehicle. And yet—despite the public’s fears and the fact that I’m clearly a diehard race fan and former driver (a few years back these pesky robots would be challenging for my paycheck)—I’m actually 100 percent on-board with Roborace. I believe I even used the word “awesome” above. Roborace will be a unique platform for experimentation, not just from the perspective of self-driving technology (which will be its focus initially) but of motorsport technologies in general. There’s a reason we aren’t breaking speed records at the Indy 500 anymore. It’s not because technology can’t do it, rather the human body can’t. Roborace, which is a part of the all-electric Formula E series (which I’m not a fan of, FYI), will not be pushing these speed boundaries initially; in fact, Roboracers will top out around 180 mph. Nor will organizers be opening the car up to innovation, producing lap times and cornering speeds never before witnessed. I, for one, would love to see how fast a driverless car—with no limitations, no boundaries—could truly lap the Indianapolis Motor Speedway. Or Long Beach. Or Silverstone. Or, well, anywhere. Hell, why don’t we reopen the oval at Monza, or see how quickly we can really lap the Nordschleife? Let’s see what the combination of extreme mechanical engineering mixed with software and code can truly achieve—blend the minds of Adrian Newey and Steve Wozniak, as it were. That’s where real innovation will derive from, not from silly aero kits or DRS systems, but in a series where man is no longer an obstacle to overcome. While Roborace may seem set to alienate the current motorsport fan base, it’s actually a great way to re-energize a sport growing stale. Our loyal followers are dwindling, and what we need are groundbreaking, physics-pushing innovations. We need things the world has never seen before, or even dreamed up. Don’t get me wrong, Roborace will not surpass our passion for pure racing—where drivers battle wheel-to-wheel, pushing one another into a mistake, wringing the last tenth out of their machines in a way that appears almost impossible. We still need our gladiators donning their helmets and taking to the field. We need real battles, real controversy, real drama. But don’t go around preaching the need for innovation to the degree that it was 20 or 30 years ago. Eventually we hit a limit, and that limit was not only financial, it was human. Roborace, or a derivative of, is the future of major innovation. Which means, perhaps, the real racing—the one piloted by beating hearts and nerves of steel—can return to a purer form. We can focus on making the racing better. And we can enjoy both forms of motorsports simultaneously. Because as we stand today, true innovation—innovation that moves the needle in a way we haven’t seen since the adoption of aerodynamic wings—cannot feasibly exist with a human behind the wheel. @Alex_Lloyd is Head of Content at Beepi, a radically transparent and easy way to buy, sell and lease cars online. A racing driver who competed in the Rolex 24 at Daytona twice and the Indianapolis 500 four times, his column Three Wide is about the culture of speed. Who Do You Root For When No One&apos;s Driving An Autonomous Race Car?